Molniya orbit is a highly elliptical orbit with an inclination of 63.4 degrees, an argument of perigee of -90 degrees and an orbital period of one half of a sidereal day. 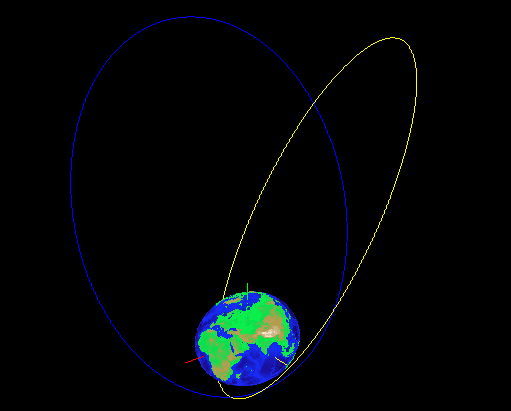 Molniya orbits are named after a series of Soviet/Russian Molniya communications satellites which have been using this type of orbit since the mid 1960s. In this example we will show how to calculate and plot satellite orbit around earth based on its orbital elements. By smallsat in Featured, Space Flight/Orbital Mechanics on January 19, 2013 . Can you explain what constitutes orbital2state? orbital2state function computes state vectors R and V in the geo-centric equatorial frame of reference using orbital elements. Please look at the code here.